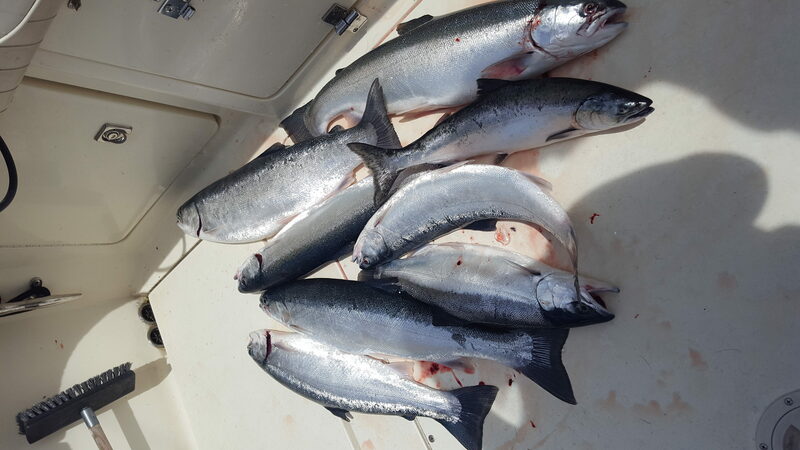 Top 40 Charters kicks off the year as soon as the ice is gone. 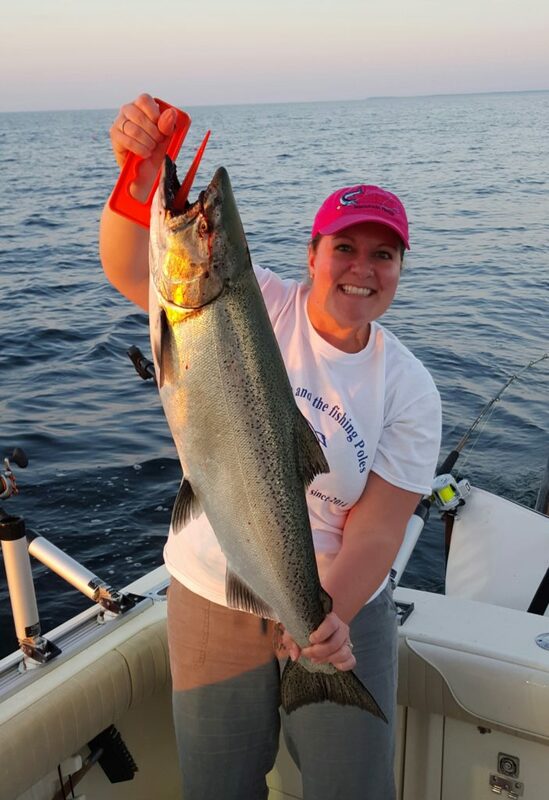 We offer full or half-day trips trolling the shallower waters of of the Bays de Noc for springtime salmon and trout. An early spring brown trout. As the ice recedes and the waters warm, salmon and trout move into the shallows in search of food. 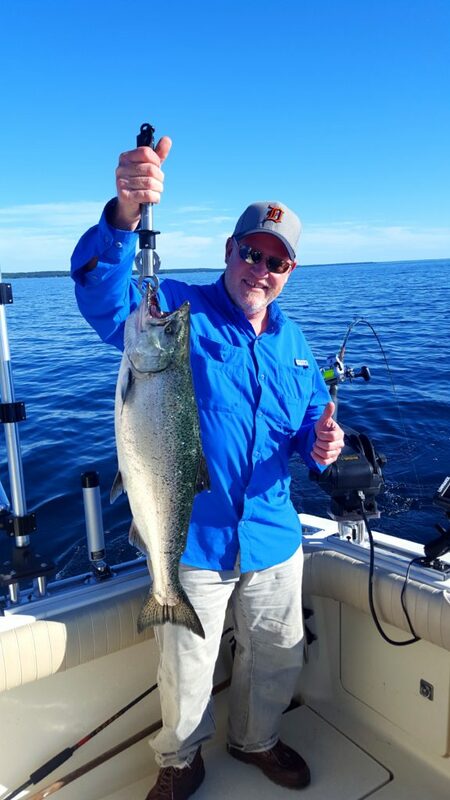 The action can be fast and furious, with the shallow water offering anglers the chance to witness a display of spectacular jumps and blistering runs. This is an under-appreciated fishery in this area, and boat traffic is usually very light. 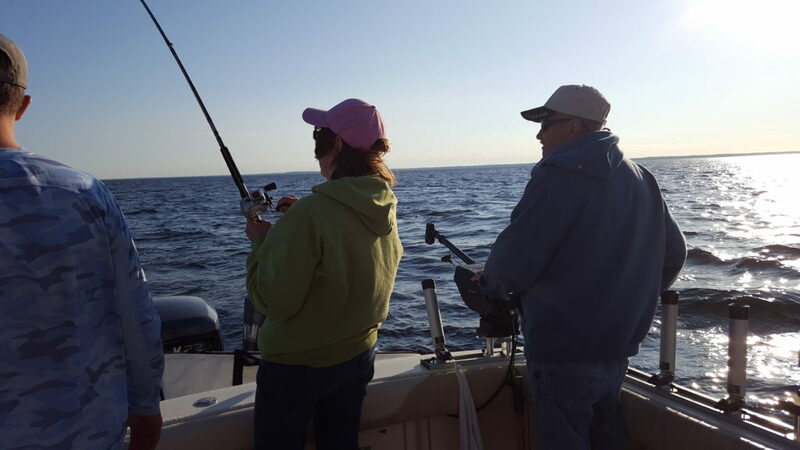 This allows anglers to enjoy the fishery without the crowds. 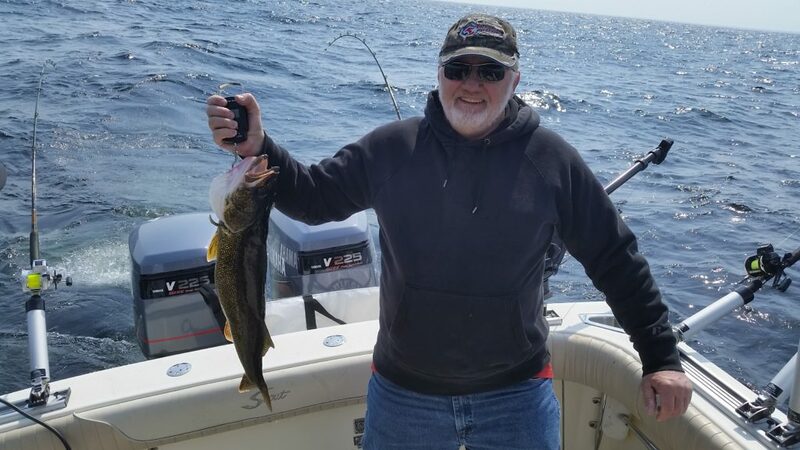 Walleye season in Michigan’s Upper Peninsula opens on May 15th. Excitement for this day ranks right up there with the opener of deer season and Packers playoff games. 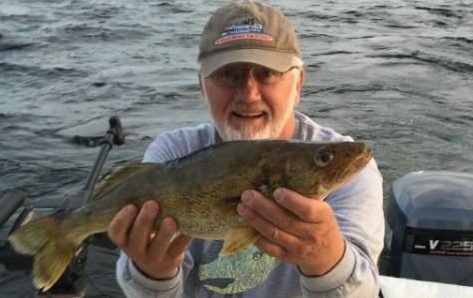 Little Bay de Noc and Green Bay are host to a world-famous walleye fishery, and for good reason: This area contains lots of trophy walleyes. These fish are concluding their spawning run when the season opens, meaning that they are ready to move out of the rivers to feed. 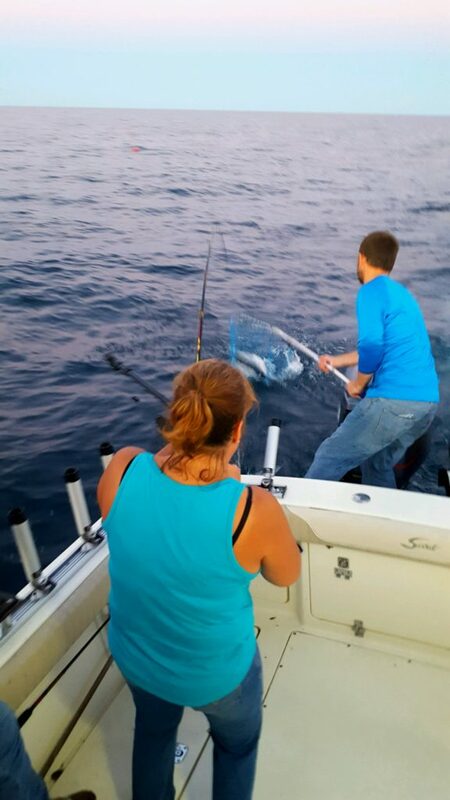 We target these fish by trolling using planer boards with a mixture of custom crawler harnesses and crankbaits. Our specialty! 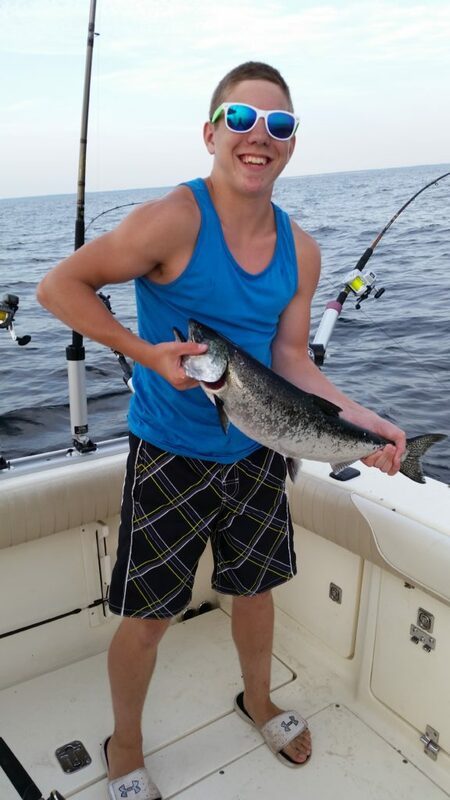 A summertime day spent reeling in salmon on Lake Michigan can’t be beat! 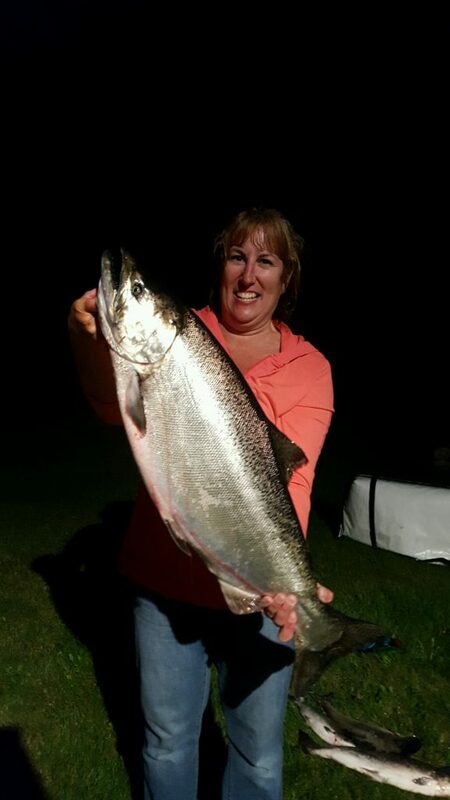 Salmon can range from one-pound jacks all the way up to trophy brutes weighing over 30 pounds. 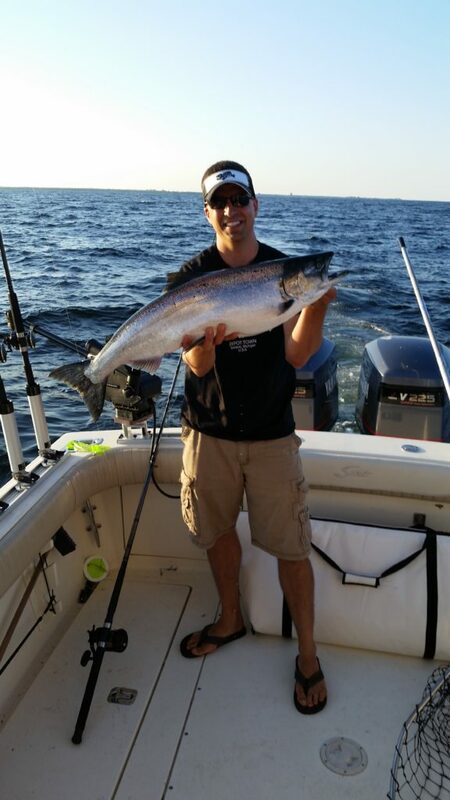 These fish test the tackle, as well as the angler. During these trips, we also target high-flying steelhead (rainbow trout) that are known for their acrobatic fights and excellent table fare. 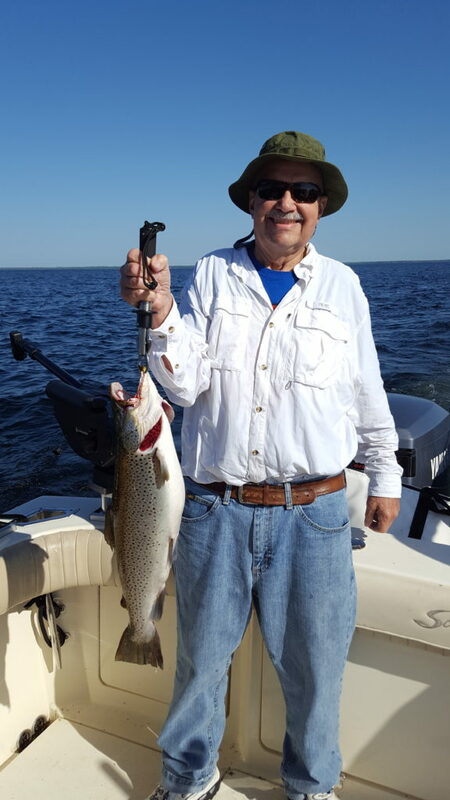 On these trips, we frequently catch brown trout, lake trout, and the occasional walleye or whitefish, as well. Salmon at this time of year are a big-water fish, found far from shore in deep, cold water (generally from 80 to 300+ feet deep). 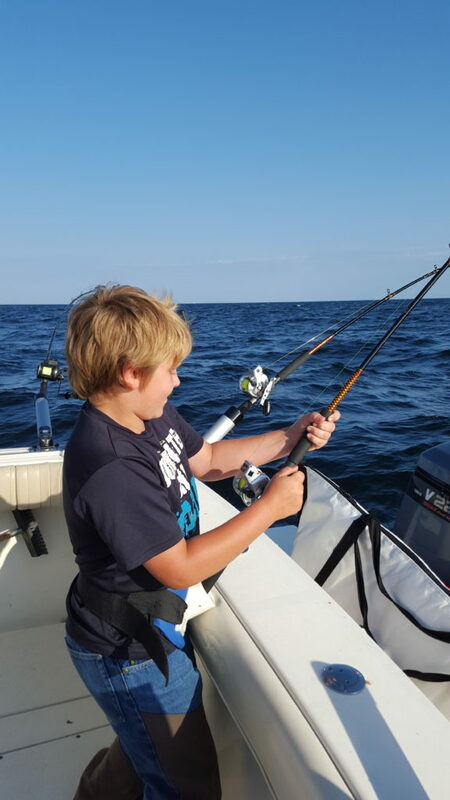 The Top 40 is equipped with the most effective equipment to target these denizens of the deep, including multiple CHIRP sonar units and electric downriggers with speed and temperature probes. 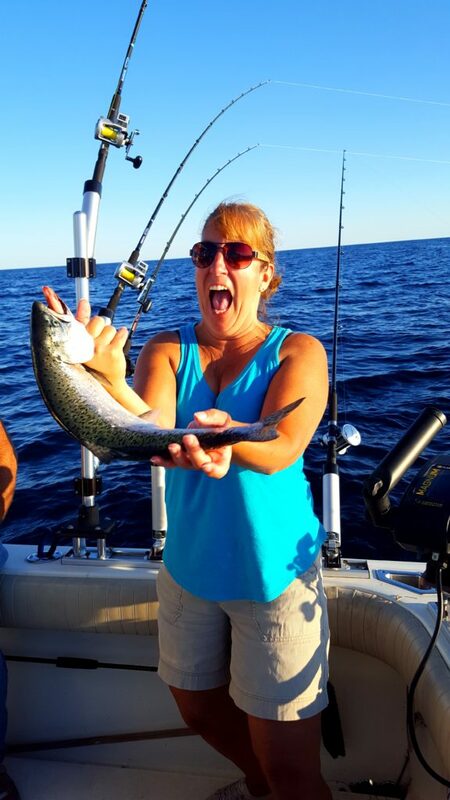 We troll for these fishing using a wide array of tackle to ensure your fishing success, employing a combination downriggers, outriggers, and planer boards to present our baits in a way that the fish can’t resist. 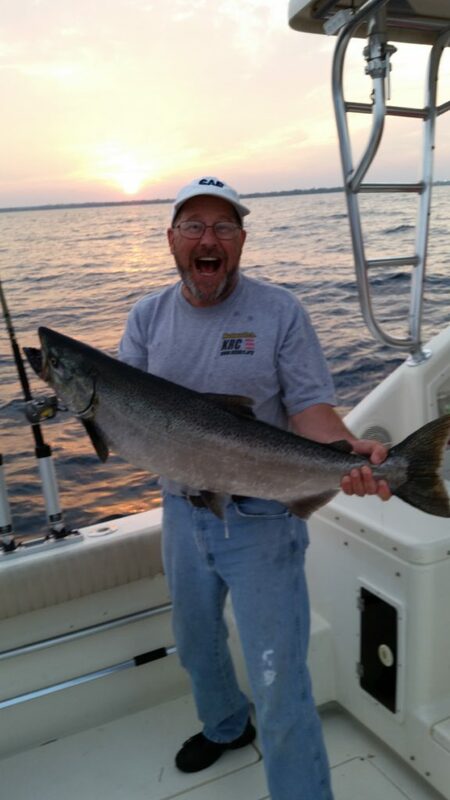 Salmon can be found in many nearby areas including Escanaba, Cedar River, Fairport, Summer Islands, Manistique, and a few secret hotspots in-between. 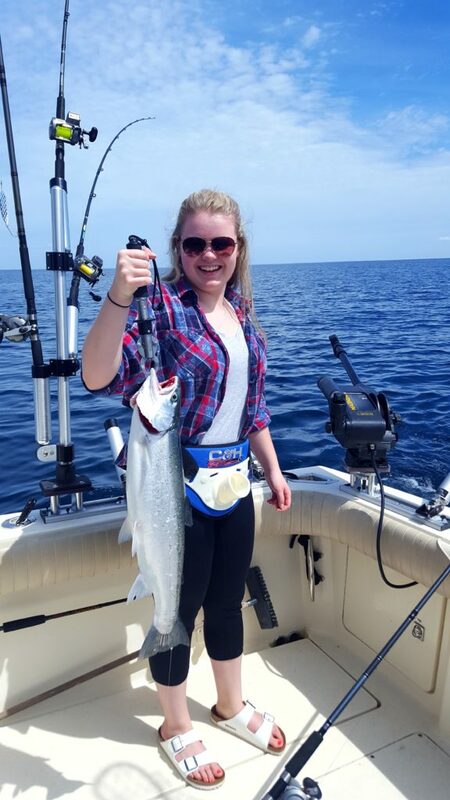 We offer either half-day or full-day trips for salmon. 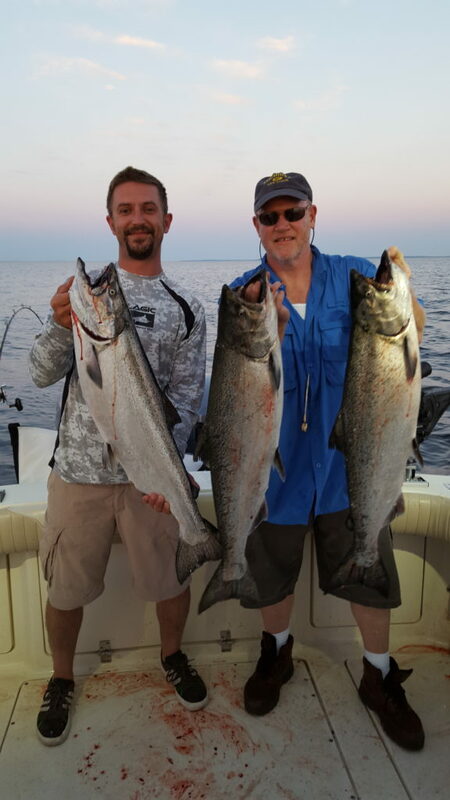 Because we often have to cover very large distances in pursuit of big salmon, these trips may include a fuel surcharge. This surcharge will be discussed before we go fishing to avoid any surprises. 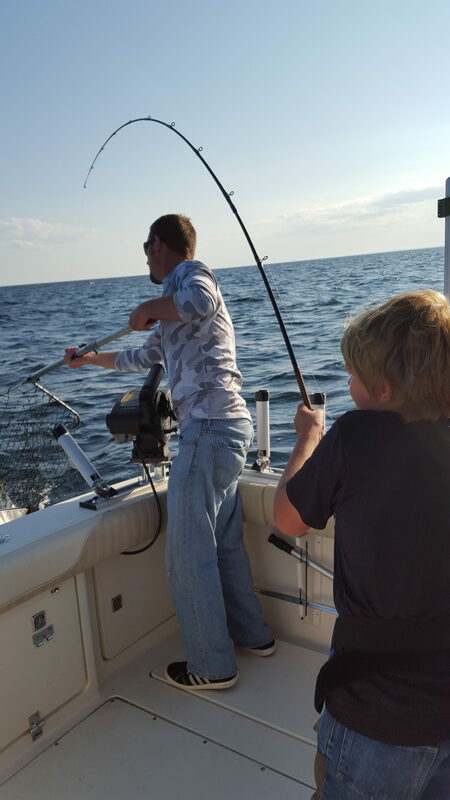 Fall is the best time of year to catch big, big walleye on Little Bay de Noc. Once the water starts to cool, walleye begin to feed frantically to fatten up for the coming winter. As always, we’re ready to get you on the water and in the path of these monsters. 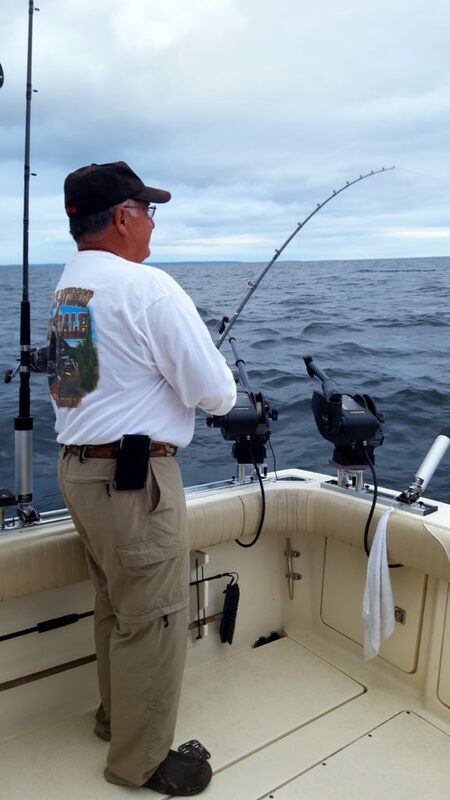 We target these fish with a mix of trolling large crankbaits to locate active feeders and jigging when we find them.